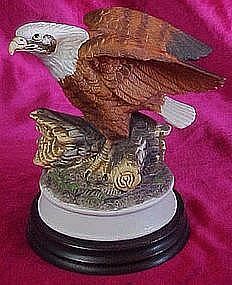 Vintage Royal Heritage Americana Collection Birds In Flight Eagle figurine. This is a wonderful majestic, hand painted bisque porcelain American Eagle from the Royal Heritage Americana "Birds In Flight" Collection, Limited Edition. It is in ABSOLUTELY WONDERFUL CONDITION, meaning that there is no damages to the eagle at all. The eagle is perched on a tree log and ready to take flight at any moment. It is a simply beautiful rendition of our national bird.I stands a stately 5" in height and is approximately 4- 1/2" in width.Comes with the wood base as shown. Wood a little scratched under the Eagle and is not visible when figure is displayed on it.